Gracie Lutz is a perfect example of how you can never be too small to make a big difference. 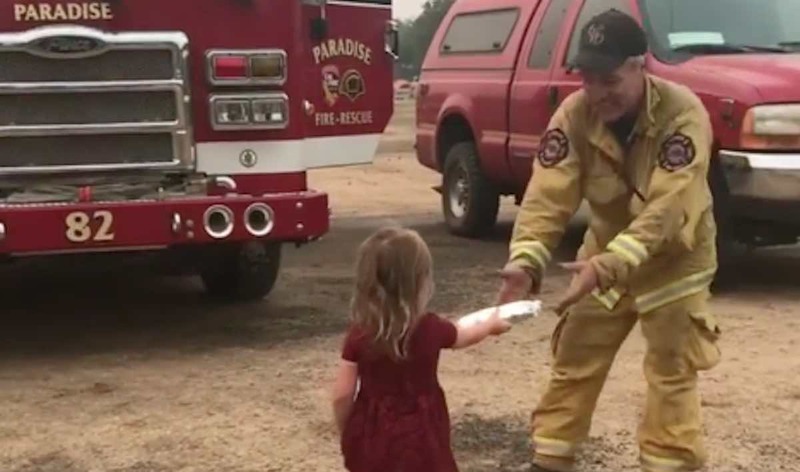 The 2-year-old girl has been handing out homemade breakfast burritos to exhausted firefighters who are currently combatting the Carr wildfires in Northern California. Gracie’s two brothers, Kody and Colton, as well as her father, are some of the many dedicated firefighters who are working 24-hour shifts in an effort to get the blaze under control. Earlier this week, Kody finished an exhausting day of life-saving work and said that he was “dying” for a burrito. So Gracie and her mother Chelsea got the idea to make dozens of breakfast burritos for the firefighters getting off of the night shift. Chelsea uploaded a video of her pint-sized philanthropist handing out the foil-wrapped breakfast treats earlier this week, and it has already been viewed hundreds of thousands of times. Clad in her little firefighter boots, it’s obvious that Gracie and her burritos provided a much-needed morale boost to the tired civil servants. Next week, Chelsea and Gracie plan on handing out spaghetti dinners to the CalFire crew. “We just wanted to show our support for them,” Chelsea told CBS News.